There are 31 of them around the country. They are home to the worst criminals. They are practically impossible to get out of, even harder than getting off a casino floor. They are called supermax prisons. 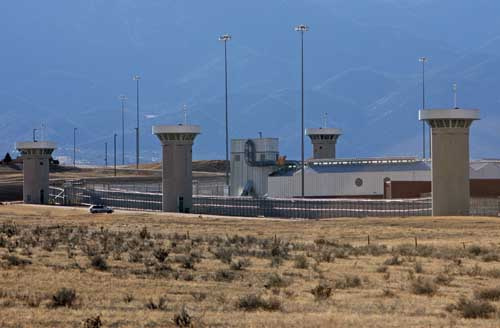 There is only one federal supermax prison, which is in picturesque Florence, Colorado. Ted Kaczynski, Richard Reid, John Walker Lindh, Ramzi Yousef, and Eric Rudolph (unabomber, shoe bomber, American taliban, 1993 WTC attack planner, and Olympic Park bomber, respectively) call it home. But these celebrity inmates are just a small fraction of the approximately 500 men housed within miles of walls. Most came here from other prisons because they were deemed a lethal threat, a high-escape risk, or both. Inmates at ADX Florence spend 22-plus hours per day alone in their cells, with little sunlight and even less access to the outside world. One former inmate at ADX Florence, Charles Harrelson, struck up a sort of friendship with an attorney named Robert Tiernan. Tiernan told ABC News what the late Harrelson revealed about his life inside the walls: "The doors on the bathrooms lock on the outside instead of in. There is just no way out ... they go inside a pit, like an empty swimming pool, to exercise, so that you don't know where you are ... Part of the plan here is sensory deprivation." There are plenty of supporters of these institutions, however. Twenty-one out of 27 comments about the article were in favor of supermax prisons, and the conditions therein. Some even called for harsher punishment, such as reinstating the chain-gang, or forcing inmates to fight one another to the death in an 'Extreme Cage Match' with no tap-out. But supermax prisons like ADX Florence are not without critics. Some call them inhumane, and several states have been sued, with lawsuits most often citing the Eighth Amendment ban on cruel and unusual punishment. In 2005, Ohio supermax inmates won a U.S. Supreme Court case, citing the 14th Amendment -- the right to due process. They argued and the Court agreed that isolation constitutes an atypical hardship. Inmates now have the right to appeal before being placed in isolation due to the Court's ruling. In 2006, Eric Rudolph wrote a letter to the Colorado Springs Gazette saying the isolation was driving him insane. He wrote: "It is a closed-off world designed to isolate inmates from social and environmental stimuli, with the ultimate purpose of causing mental illness and chronic physical conditions such as diabetes, heart disease and arthritis." To read the article, go here. To read the comments, or post one of your own, go here.